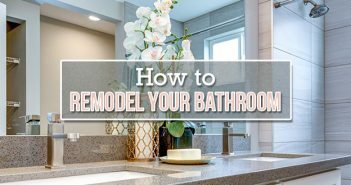 We’ve covered some big projects in the past, such as bathroom remodels, replacing wall tiles and even gutting an entire room. 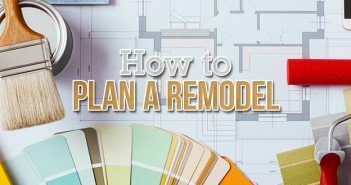 Now it’s time to take things down a notch and look at some simple kitchen upgrades you can do to renew your kitchen without going big with a remodel. After all, the epicenter of your home resides within the kitchen, why not make it the best it can possibly be? Here are 25 simple kitchen updates that will transform your kitchen and make it easier to clean, cook and kick back. One way to really make your kitchen look great is to add a pop of color. If you don’t feel like painting the whole room, you can just do one wall. Making your own trash can holder is a great way to hide your garbage bin and disguise some of those unforgiving odors. Save on counter space by storing your onions, potatoes and other vittles that don’t need refrigeration in drawers. With this little kitchen update, you’ll have plenty of room in your fridge. Are you sick of your outdated vinyl kitchen floors? If so, you can try installing your own hardwood floors or call in a professional to redo your kitchen floor. It may not be the simplest kitchen upgrade, but it’s a minor aesthetic change that can really improve the look of your kitchen. Tired of stacking your utensils in a silverware drawer? Vertical silverware storage allows for you just to toss them in while remaining organized. Quit hiding your wine from your judgmental mother-in-law and install one of these beautiful built-in wine racks to show off your well-traveled palette. While you may need help from a professional, installing a vacuum system directly into your kitchen’s baseboards will make clean up effortless. Install trash and recycling chutes in your walls and you’ll never have to walk to the trash can again. Just make sure you bag up your bio-degradeables before sending them down the chute. You can hide those food and water bowls with these cheap and easy to install built-in pet bowls. Or you can build your own raised feeders that keep the bowls off the floor and make it easy to clean underneath. Running out of space in your fridge? Consider adding a mini fridge to your kitchen island. With a little organizing, and a nearby power outlet, you’ll have a nice little place to keep snacks and drinks. A cutting board with a hole in it is perfect for peeling and cutting onions. Simply peel your onion, toss the scraps in the hole, cut the onion, maybe cry a little and enjoy! This may not be the best idea if you have small children, but it is a great idea if you hate having a big knife block hogging up space on your counter-top. Side bonus: the look on your guests’ faces when they see your hidden knife collection suddenly emerge from the kitchen island. Build your own produce stand for under $30 with a few pieces of wood, nails and a drill. You can put it at the end of your counter for a good place to store fruit and vegetables. Get rid of your bags of flour, containers of sugar and whatever else you may have and replace them with a baking drawer. Stacking your pots and pans can quickly become a nightmare when it comes time to get them out. Hanging your pots and pans is a simple kitchen upgrade that can make getting to them 100% easier. If you want the look of stainless steel without paying an arm and a leg for it, you can buy paint for your refrigerator that mimics a stainless steel finish. Washi tape is great for decorating in a place you don’t own because it doesn’t leave marks. You can make your fridge colorful and fun with a few strips of washi tape. A colorful mosaic looking style backsplash is a great way to add some color to your kitchen and the best part is, you can buy peel and stick backsplash. Fake drawers are almost as bad as fake pockets on suits and pants, but if you are stuck with some of these drawers you can make them useful as a place for storing sponges or hiding electrical sockets. Does standing in the kitchen kill your feet? If so, you can buy anti-fatigue mats which will help you stand for longer without pain. Adding glass to your cabinets is a great way to make your home look expensive and modern. It will also help you be able to see what you have without having to open every cabinet door. When you’re short on storage space, it is important to make the most of what you have. You can easily install drawers in the baseboard areas of your kitchen to hold pans and other flatware. Hiding your electrical outlets in drawers is a great use of space. This handy trick is also great for rooms like the bathroom. You can make your own little coffee station by hanging a tension rod with hooks for your coffee mugs over your coffee maker. Do you have any other ideas for a simple kitchen upgrade? If so, leave us a comment in the section below with your ideas, we always love to hear from our readers. 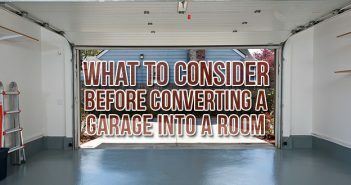 Thanks for reading and feel free to browse our entire home improvement section or check out our Exceedingly Comprehensive Guide to DIY Home Improvement for more remodeling and renovation tips.